I’m new to the Grandparent’s business, I admit. Payton is not quite 4 months old, so it’s clear I have a lot to learn. One thing I do know: after 21 years out of the baby business, I now see that babies have it SO much easier today. This formula dispenser is from Munchkin. I first saw this with Payton’s bottles. So much better than we had! Payton swallows almost no air with her bottle, which is such a refreshing change! 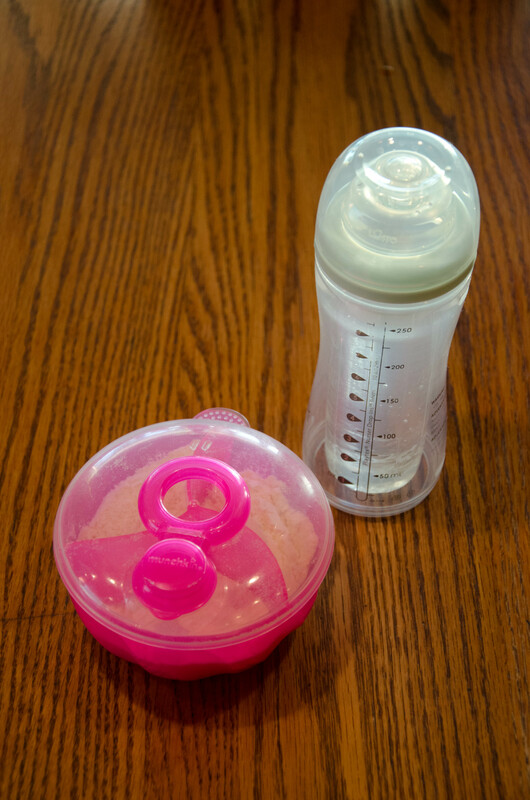 Making bottles was made so much easier, too, since formula mixing is now simplified with a formula dispenser like the one illustrated. The next innovation — again, not that expensive, is the Bumbo Seat. 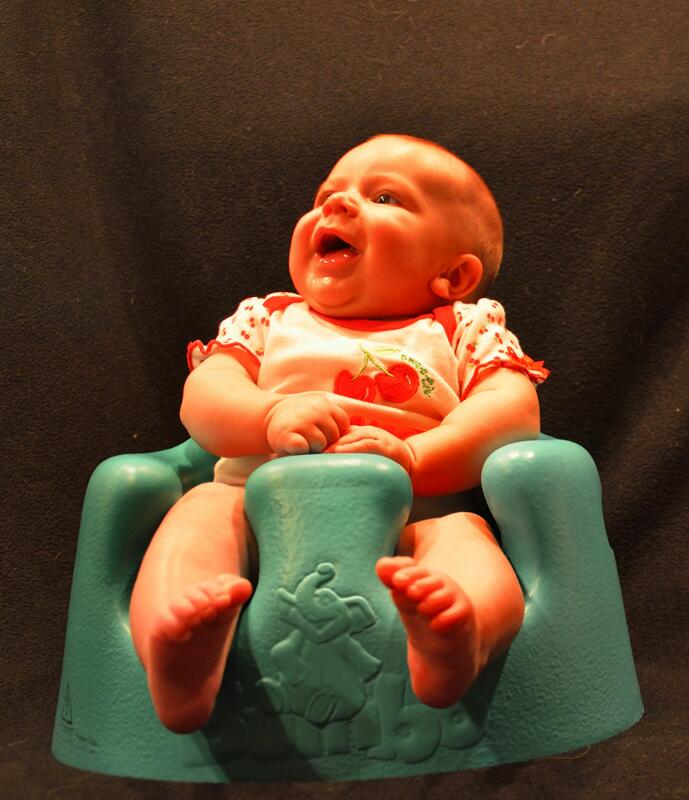 One of our great tragedies as new parents was the alternative product from 20 years ago … the infamous Sassy Seat. The Bumbo with tray is $64.95 on Amazon.com. It is PERFECT for a baby that can hold their head up, but isn’t quite ready to sit erect on their own. You see, my only wish as a new parent was to get a healthy baby. Boy? Girl? Not my concern. I wanted a healthy baby, but that’s not what God had in mind for us. Christopher (who later told us he was afraid of Mom’s skeleton) decided to be born 8 weeks early. So there we were, 27 years old and basically alone in California … with a baby born weighing 4 pounds, 13 ounces and living in the NICU: Neo-natal Intensive Care Unit. He had a scary beginning; he was placed on a ventilator when he was 1 day old. But he did indeed get stronger after that initial misstep, and we got to bring him home when he was 2 months old. Eventually, he grew stronger, and when a few months old, he joined us at the kitchen table in a Sassy Seat. Come to find out, that product was introduced in 1982 (Christopher was born in 1983) … and we bought it. I had no idea how bad a decision that would prove to be. 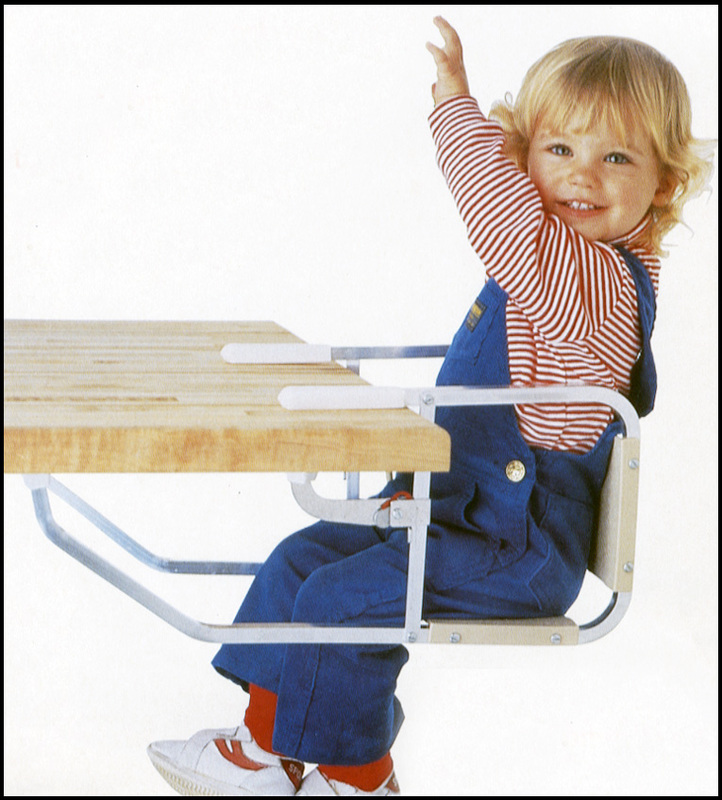 This picture from the Sassy Seat website looks a lot like the seat that Christopher lost his first tooth on. The initial version of the Sassy Seat — as shown on their website today — had square aluminum tubing as the seat’s structural members. The problem was that Christopher, as baby’s eventually do, began to cut his teeth. One of his front bottom teeth came in first. We placed him in the Sassy Seat, and he wanted to chew on the square aluminum tubes because, well, he could. The problem was that he got his tooth hooked under the aluminum tube, got scared, and then jerked his head up with enough force to RIP THE TOOTH OUT OF HIS MOUTH. That was not a fun Sunday evening. An emergency trip to a pediatric dentist (who told us to put the tooth in a cup of milk and meet him at the office), who then had me hold my baby down so he could shove the tooth back into the empty socket in his jaw. This was not a good night. Pop the tray on, and you’ve got a great place for toys … and Cheerios in a few months, I predict. Christopher’s tooth, amazingly, stayed put in his jaw as a spacer until his adult teeth came in. A happy ending, indeed. However, had we had a Bumbo Seat, we would have never had the problem in the first place. 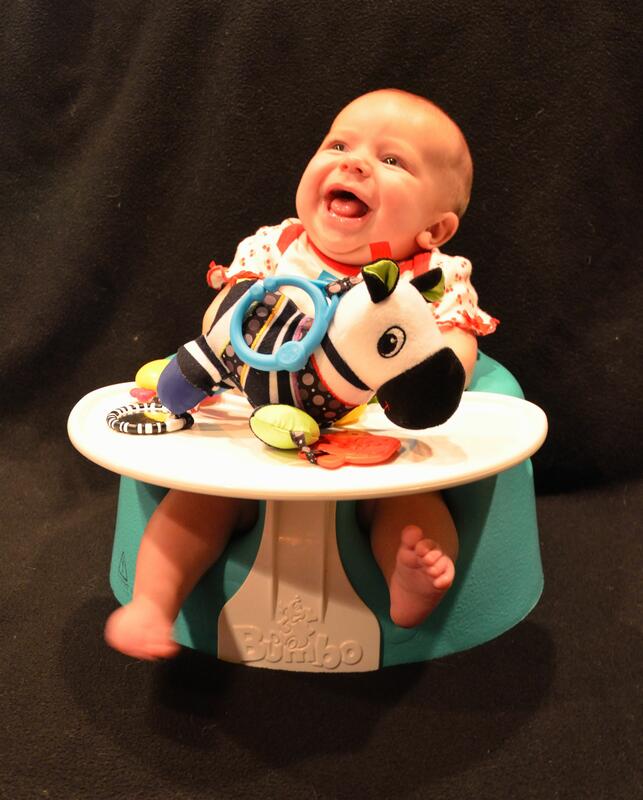 I’ve seen Payton join us at the dinner table in her Bumbo, and heartily recommend it to you. Today’s babies deserve no less. As I said, I’m new to the Grandparent business, and when we needed to buy a baby swing for our house, I asked Velda to make sure that I was there in addition to our Visa card. I knew things had changed since we bought our last swing about 29 years ago, and, man, Babies R Us did not disappoint. We got the swing, and it’s great. It’s a jukebox. It’s a light show. It swings in 3 directions. It’s AC, it’s DC … it even has flying sheep and waving, billowy clouds. I am CERTAIN that Fisher Price charges more today than whatever manufacturer we bought from in 1983. 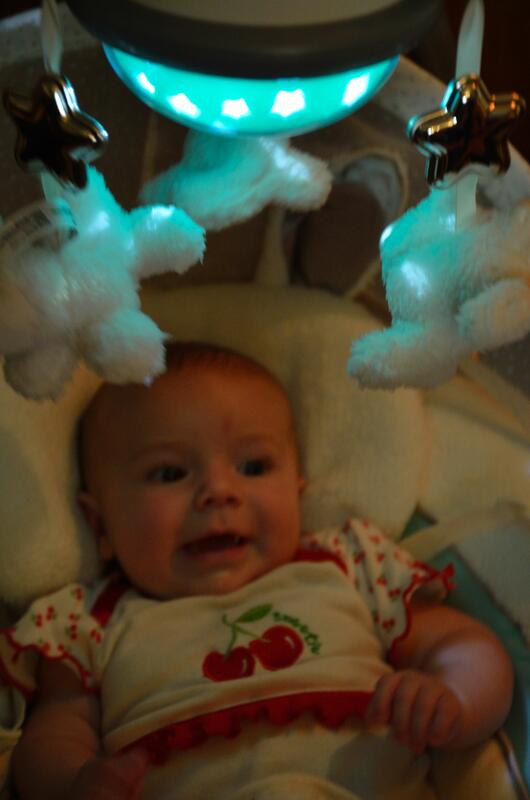 It plays lullabyes, bathes baby in starlight, and even shuts the swing down when it thinks baby should be asleep. Like I said, babies have it easy today. Baby’s parents have it easy, too. But after 29 years of progress, isn’t it reassuring to learn that things are getting better? Progress is a very good thing, and who would want it any other way? The next generation should have it easier. Isn’t that why I have been working so hard? Payton agreed to model for this picture in the twilight of the swing, but as her wide-awake eyes attest, she was not going to sleep!